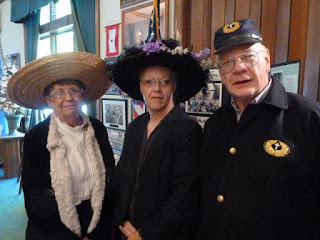 Big thanks to Shirley Penna-Oakes and her crew (here are two, Jan Bueckers, and "Chaplain" Mike Chandler) for all the hours of publicity they gave EWGS and Walking with Ancestors over Memorial Day Weekend at the to-do at Heritage Funeral Home. Her display and picture board were impressive. 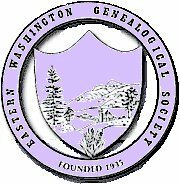 EWGS offers great meetings, wonderful classes and seminars and workshops, and volunteer opportunities that foster friendship and networking. Come along next opportunity and see for yourself. Shirley Penna-Oakes crafted a nice flyer for EWGS about this event which was handed out at the recent meeting. Here is the information from the Heritage website. Shirley, Dani Lee and Mike will be there most of the time telling folks about EWGS. YOU are invited to come to enjoy the displays, the tours and the day.... or to help Shirley, Dani Lee and Mike man our EWGS display station. See you there! MEMORIAL WEEKEND OPEN HOUSE -- 9:00 a.m. This year we are honoring ALL who have served our nation in the Armed Forces--living and dead. We ask that you share this experience by bringing in a military photo (veteran, deceased or currently serving) to place on our "Wall of Honor". --Musical entertainment each day at Noon and 1:30pm in the Heritage Chapel. This will honor the Korean War and Vietnam War era and is titled "From Inchon to Saigon". Popular songs from the era will be highlighted. Plan on joining us Memorial Weekend--Saturday, Sunday or Monday, 9:00am to 5:00pm (exhibits close promptly at 5:00pm each day). 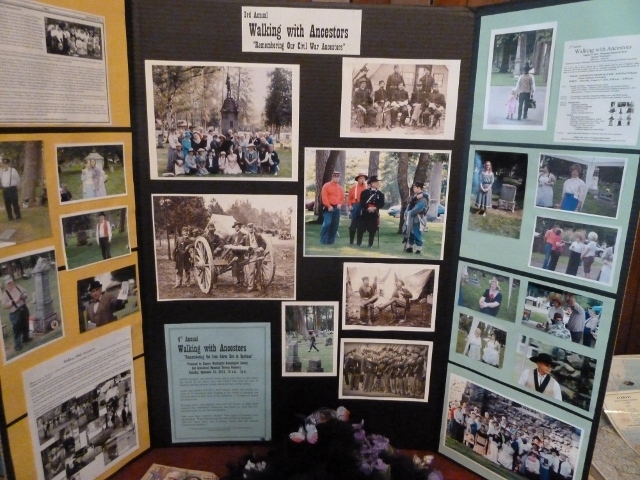 The Inlander has a a nice article on genealogy today "How We Got Here". Lisa talked to my fellow genealogist Miriam Robbins and also to my friend Vicki Dalton the Spokane County Auditor. When I visited Plimouth Village (near Plymouth, Massachusetts) in April I learned something interesting about trees....... the trees that were there when the Pilgrims arrived. Plimouth Village is the re-created village home of the Pilgrims as it would have been in 1627 and the biggest reason to visit is that employees are costumed actors portraying the Pilgrim band in that year and talking with you as if in that year and no later. He also explained that "here the oaks grow wild "as God moves" but in England they were well tended to grown tall and straight." Oaks and alder trees are planted together. 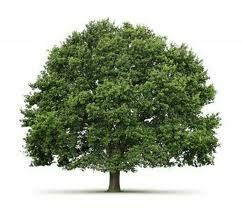 When the alder trees area bout 16 feet high they are cut off leaving all the sun and room to the oak. By this protection the first 16 feet of the tree are tall and straight and "it only takes 15 or so years, "if God wills." I really smiled to hear his use of the word "infested" as pertaining to thick groves of trees in their new world. I would not thought have using that word in that fashion. You can drive through the Massachusetts countryside and the towns where your ancestors might have lived, but you cannot really see it as it was 300 years ago. Only in the voice and words of somebody living there then. I recommend a visit to Plimouth Planation to learn about how our ancestors really lived. Check out their website, www.plimouth.org , or look for the U-Tube videos of that place. Well today I got the pleasure of giving the gift EWGS got for the retiring Spokane Public Library director Pat Partovi. It was a travel diary and a card signed by several of us from EWGS. 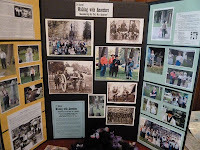 I also gave her the picture from the EWGS scrapbook showing the first day of the new Spokane Public Library as people made a human chain to pass books from the temporary library location in the old Pennys building to the new library. This was Pat's first day of work at the Spokane Library. The picture showed EWGS members Melody Hall and Donna Potter-Phillips passing books and the new building in the background. 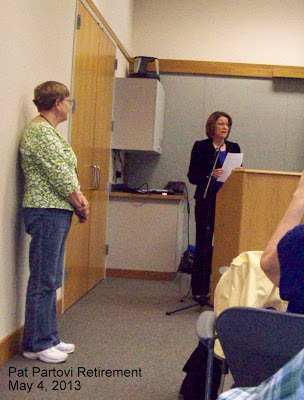 This picture was Pat thanking EWGS for our help with the library over the years, and Mary Holcomb our vice president looking on. We will miss you Pat, but happy retirement. 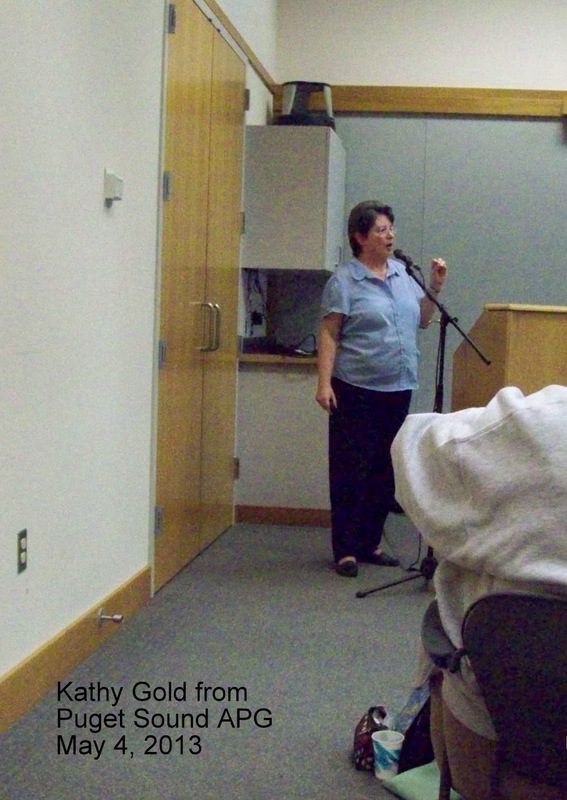 This is Kathy Gold from the Puget Sound APG group. She talked about "The Methodology of a Reasonable Exhaustive Search". She was expecting a small group and so the large group that showed up was a surprise, and she is a good speaker, and impressed with our collection. 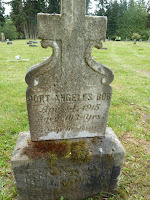 While I would like to be in Spokane attending tomorrow's EWGS meeting, I am on "family duty" in Port Angeles. 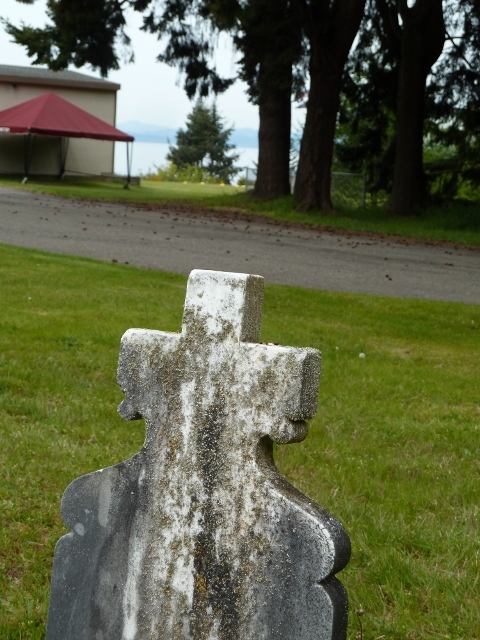 And when I am here I enjoy walking in the Ocean View Cemetery which is on a high bluff over looking the Straight of Juan deFuca on the west side of Port Angeles. The obituary for "Chief "Bob," Our Oldest Indian" appeared in the Olympic Leader on 16 April 1915 and reads: "Port Angeles Bob, a cousin of Chief Seattle, and the best known of the Clallam Indians, being at least 110 years old, died at his little place.... where he had waited for many long years for the grim reaper to come and take him into the unknown." The obituary went on at length to tell of his visit to Seattle two years previously and when a streetcar whizzed by he was asked what he thought and "Heap fast," he grunted." 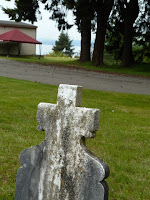 He was taken to the statue of Chief Seattle and "he gazed on it for several moments earnestly. "Heap big chief," he declared at last. All same my father, Chief Norman." "Bob was unusually well preserved, considering that his life extended back to the administration of Thomas Jefferson."